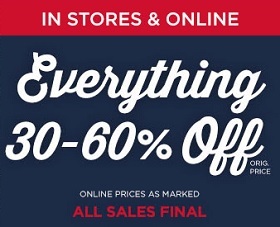 Everything is on sale at U.S. Aeropostale stores and online during their special offer. You can take an advantage of savings reaching 60% from original retail prices. All sales final. The offer is time limited. Source of the information is Aeropostale. For more details visit any Aeropostal store in the U.S. or Aeropostal online.